Everyone can, and should carve a wooden spoon. 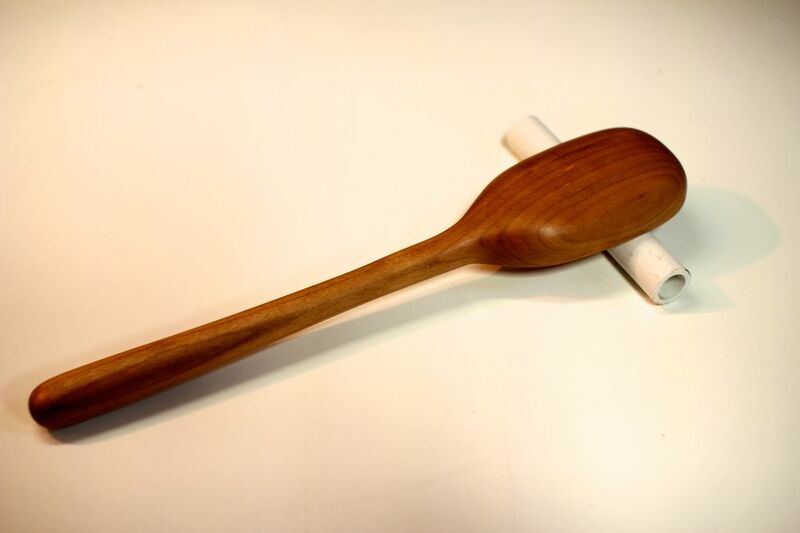 This Instructable will show you how to get started carving your very own spoon and hopefully answer some of the basic questions regarding wood carving, whittling, and how to create your own wooden spoons that you can cook and eat with. I've been collecting spoons of the world for a while (see second photo) and have always had an interest in odd spoons. Big ones, tiny ones, it doesn't mater really, there's just something about the spoon that from a design and function standpoint catches my interest. At some point I eventually started making my own spoons, and carving them with other people as well as a social event - it's a great thing to share in as a group activity. Carving a wooden spoon is a great activity because the process is directed, but still has a place for creativity. It's easy enough for anyone to learn and delivers success at virtually any level of completion because there's always a use for an odd spoon and even when they don't go exactly to plan, they still come out as a beautiful handmade work of functional art. I'm going to share my process for spoon carving in this Instructable. It's by no means the official way to do it, or even, a carving purists way to do it since it involves the use of several power tools that all remove wood more quickly than hand carving. Please just use this Instructable as an inspirational guide to start carving wooden spoons and utensils, and not as the end all word on the very complex and highly skilled process of wood carving, of which, I am by no means an expert or qualified teacher. The most important thing to first consider when carving a spoon is the type of wood that you're going to use. While it's possible to carve virtually any type of wood given the right tools and techniques, some are easier than others to learn. Since this is spoon carving for beginners, let's try to keep things easy. That being said, I really enjoyed working with the softer side of the hardwood range, specifically cherry. Test it out and see how it feels to try and actually carve a piece off. Look for short grain, not long grain patterns - long grain seems to chip away in big pieces, you want small pieces to chip off so you can carve with more precision and control. I tried carving a piece of amapola for example and huge uncontrollable chunks came off without warning. This made it hard to carve. Look for soft varieties when possible, maple for example is very hard and will be hard to carve by hand. As a beginner the absolute easiest wood to try carving is Basswood, so it might be best to start there. As I said before, I found Cherry to be a great balance between hard and soft wood. Finally, it should be noted that wood, like many of the substances that we live with can be a potential allergen to certain individuals. Some types of wood, like cocobolo have known respiratory and skin effects. Other varieties, such as cherry, are known to be generally safe and inert. Wood dust from virtually any species of tree can have adverse respiratory effects over a long enough time period. It's important that we all mitigate these possible risks and make informed decisions about the things we expose ourselves to on a day to day basis. While most woods are generally safe to work with, if you are just getting involved in woodworking this simple database of known allergies is worth taking a look at. Once you've selected your block of wood (I'm using Cherry in the example below) draw a very rough outline of the spoon that you'd like to carve. It need not be detailed, as this outline will only be used to create the spoon blank. Drawing a profile of the spoon you'd like to carve from the side view on the block of wood is also useful, but not necessary. There are literally endless different designs for spoons. Check out some galleries and get inspired. Things can get pretty crazy in the wooden spoon world! should it fit in my mouth? If the spoon you want to carve is smaller than the piece of wood you've selected, use the table saw to cut the chunk into a thinner piece so you have to remove less material by hand when carving. Then, use the miter saw to cut the chunk of wood to length at the ends of your spoon outline. This is called creating a blank. Something that's fun to do is to create many blanks at once and then pass them out to your friends so you can all carve together. Bring some knives and it's a carving party! Next, use a scroll saw to cut along your outline. I tried to cut as close to my spoon sketch as possible since that's less material to remove later. That being said, if you want to have more material to be creative with as you carve, give yourself a little more room when you cut. You can't go wrong by making your blank a bit larger and thicker then the intended finished spoon, you can always remove more material later. If you want to spend more time carving - simply skip this step and remove more material by hand using the carving tools. This step is completely optional, but since it was sitting right next to me, I used the belt sander to quickly round over the edges on the spoon and sand down to my spoon outline. Again, anything done with a power tool just saves you the work of having to do it by hand in the forthcoming carving step. Finally, let's make some wood shavings! Now at the very beginning it's useful just to get a feel for the knife and how it removes material from your spoon blank. Carving along the shaft or handle of the spoon is the easiest place to practice. Start by taking small strokes, removing small amounts of material, and carving away from yourself. While there are situations where you can safely carve towards yourself, at the beginning it's easier to just carve away. Think about removing small chunks of material strategically from the tops of curves. Carving down, into notches is more difficult and so I usually like to orient the wood to my knife so that I'm carving over the crest of a curve or along a straight line. Diving the knife down usually results in a larger-than-intended piece of material cleaving off. Better to stay in control of the cut and carve along the top of the material. Turning a square block-like blank into a smooth spoon takes time - as in, several hours. So, don't expect the spoon to take form instantly, instead, just stay with it and work slowly towards the goal. The spoon pictured below has a blunt straight head, more like a spatula that's good for scraping the bottoms of sauce pans and removing brown tasty bits...of course, this would not make a very good soup spoon. Once you've roughed out the handle of the spoon it's time to start working on the head. I found it easier to start with the convex back of the spoon rather than the dished out concave side. Begin removing material along the edges of the blank and round out the spoon head to make a smooth transition from the back of the spoon to the rim/wall. Keep rounding out the back of the spoon and creating a smooth continuous slope. On to the concave side of the spoon - use a rounded sweep gouge or hook knife to start removing material from the face of the spoon. Remove small bits of material until you begin to form a small divit. Keep removing material digging out wood closer and closer to the outer wall of your spoon. I alternated between gouging from the center of the spoon towards the wall and working the tool down the wall of the spoon towards the center. Different strokes for different folks...and tired hands. The hook knife was useful for shallow divots, but not very good at digging deep. That's where the sweep gouge comes in handy. After extensive hand carving it was time to smooth out the carving marks with some sanding. I used a small drum hand sanding attachment for a rotary tool, a 1" diameter 80 grit flap wheel and the small Dremel sanding heads to sand the inside concave dish of the spoon. Hand sanding and a belt sander do just fine for the easier to reach back and handle of the spoon. After the mechanical sanding came a bunch of detail hand sanding. Starting with 120 grit paper and working my way up to 220 incrementally, I sanded every knook and cranny of the spoon smoothing out any remaining carving tool marks and making all the surfaces pleasurable to hold and splinter-free. As a final step, apply a food-safe protective finish to the smoothly sanded spoon. I used a product called "Emmet's Good Stuff" which is a food safe Gel Varnish that I've used in the past and had good results from. UPDATE: Emmets Good Stuff although claims to be food safe, is definitely not! Thanks so much The Green Gentleman for posting a link below in the comments to the MSDS sheet. Don't use this stuff! I will re-finish the projects that I've made that use it with some thing that's actually food safe. Mineral oil is also an completely acceptable finish, as well as any other "butcher block oil" or beeswax based finish that you may like to use. Once the finish is dry you've got a spoon that's ready to use and enjoy! A finish that contains toxic chemicals may be quite safe after it dries and cures. Of course you would not want to drink to solvent in an oil-based finish like polyurethane, but that evaporates and outgases. Once dry, a wooden spoon with such a finish might be no more dangerous than a plastic spoon..
Walnut is a good choice for anything that will come in contact with food. However, the oils in walnut are irritants, so wear a mask. At least use a fan to keep the dust going away from you. Walnut was my favorite when I was a knifemaker, but it would tear up my sinuses for days. I used walnut oil for food finishes, and occasionally I "hot buffed" the knife hndle with carnuba wax. Very nice. I have an appreciation for complete hand tool workmanship. If you have a band sander, mot of the "carving" can be achieved using that tool, including the back and the handle. All but the bowl of the spoon. Not for the purist perhaps, but very efficient. A dust mask and vacuum is important, though. This will create a TON of wood dust. Not sure this is the 'pure' way to hand carve a spoon but so what you end up with a good product. That's a great idea, I love the finish walnut oil gives, but might it make the spoon unsuitable for people with nut allergies? Tung oil also makes a nice hard finish if you want something natural with gloss. Thank you! I've often thought of trying to carve a spoon. Now I have a place to start! Would walnut oil finish come of a spoon if it was used as a tea spoon e.g. Lifting out a tea bag? Personally I like seeing the very small toolmarks in hand made woden items, spoons, Kuksas, etc. It's an aesthetic choice but I also think it's nice to see how things were made well before the advent of sandpaper. My Dad taught me how the Japanese master craftsman would use wood planes to get a mirror finish. Can you boil a spoon in salt water to food safe it? I'm a school trained cook and I've cooked in and managed kitchens for over 20 years. So I thought I'd just add my 2-bits on the wood finish. You can't bring new wooden surfaced tables or cutting boards into a commercial kitchen any more (due to idiots who didn't care for the wood so it developed cracks and/or wasn't sanitized correctly). However I still delt with many butcher block tables that were grandfathered in and was trained in their care at school. In a commercial kitchen you clean the wooden surface by wiping it down with a light bleach/water mix (occasionally, if needed, it gets scrubbed down, but this is seldom if ever needed as long as it's wiped down regularly) and then once a week it gets oiled with vegetable oil (I've heard that you should only use linseed oil as vegetable oil will go rancid and smell. However I've been using vegetable oil at work and home for many years and have never experienced the oil going 'rancid'). I basically do the same thing with my wooden cooking implements at home (though I don't bleach or oil as often). So to sum my recommendation up, I'd just use oil for a finish and occasionally renew it. I would never use varnish on an item that was going to be in direct contact with my food. P.S. The oil reapplied over the years will make the wood harder and more durable also. The oil will make it more beautiful too, BUT linseed, however, has chemicals added to it to "boil" it without using heat--since it's extremely flammable--and that makes it dangerous to use around food. But citrus does an amazing job at disinfecting and is good for wood and harmless, as opposed to bleach. Not to mention it's environmentally friendly. I've cleaned a ton of wooden items as a maid who made her own cleaners and also never had a problem with veggie oil, even on floors. Vinegar works amazing at sterilizing too! But extended use will pull up varnishes, including any oiled seasoning. So it might be a good option or not, and it can be watered down as well.